Pop Culture Lunch Box: Classic Reads: A Farewell to Arms Introduces Us to Hemingway's "Lost Generation"
Classic Reads: A Farewell to Arms Introduces Us to Hemingway's "Lost Generation"
The is the second in a series of posts about classic books that I, as an English literature undergrad major, really need to read or re-read to make my life complete. A beautifully described story combined with a depressing ending is pretty much par for the course for the nearly unmatchable Ernest Hemingway. 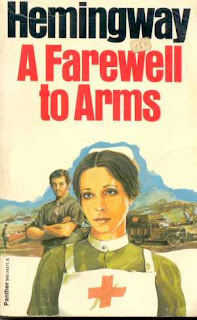 And A Farewell to Arms, described by his mentor Gertrude Stein as his best novel, is no exception. The story, at its essence, is about how war, and really society in general, "kills you in the end." This is especially true of the World War I generation of which Hemingway writes about, and he argues that those who fought in it became a generation of cynics. Hemingway, having served as an ambulance driver in the Italian army, bases a lot of the social commentary on his own wartime experiences, including the nearly-unheard-of-at-the-time unmarried love affair between American Frederic Henry and British nurse Catherine Barkley. While serving on ambulance duty in the Italian army, Frederic is caught in the line of mortar shrapnel, which turns his legs to "hamburger." While he recovers in Catherine's care in Milan, they take carriage rides in the park, attend horse races, and dine in street-side cafes. Right before he leaves to return to duty, Catherine informs Frederic she's pregnant but refuses to marry him. With morale sinking and a once-winnable battle looking more hopeless, Frederic's best friend Rinaldi contracts syphilis. And it gets worse. Retreating, their vehicle gets stuck and they have to hide in barns, dodge Austrian patrols, and even avoid trigger-happy Italian sentries on their own side. Finally, Frederic is grabbed by an italian military policeman and accused of being a spy. Sitting in prison and awaiting execution, he determines the war is over for him and he should say his "farewell to arms." While the guards are busy executing another prisoner, Frederic is able to escape and swim down an icy river. He can't find Catherine in Milan but eventually reunites with her and they escape to the mountains of Montreux, Switzerland. They play chess, cards, go skiing, and take long walks, discussing what they will do at the end of the war. But then the baby is delivered dead and Catherine soon dies as well, in Frederic's arms. The story ends with him walking through the streets, aimless and broken. This is clearly one of the greatest novels of all time. However, it's only my second-favorite of Hemingway's "lost generation" novels. The Sun Also Rises is in my top three novels, along with The Great Gatsby and On the Road. Please do not forget that do not use any household cleaners of yours in the hot tub because if you use then the hot tub comical balance will be destroyed and that will be too much harmful for your hot tub.